46077, 46107, 46113, 46183, 46201, 46202, 46203, 46204, 46205, 46208, 46214, 46217, 46218, 46219, 46220, 46221, 46222, 46224, 46225, 46226, 46227, 46228, 46229, 46231, 46234, 46235, 46236, 46237, 46239, 46240, 46241, 46250, 46254, 46256, 46259, 46260, 46268, 46278. This store is located on Pendleton Pike between I-465 and N. Franklin Rd. Whether you have good credit, bad credit, or no credit, our team is ready to help you find a great used car that meets your budget. We sell all makes and models, with great late-model low-mileage selections from Ford, GM, Chrysler, Jeep and other brands. Whether you are looking for a used minivan, crossover, convertible, truck, suv or sedan, our team will help you find the perfect vehicle for your lifestyle. You can buy or lease your next car. We also have a great service department as well to help you with your next oil change, tire rotation and more. Visit me and our team at CARite of Indianapolis today and see why "Yes Means More" here! The manager of this location is Ryan Stevenson. 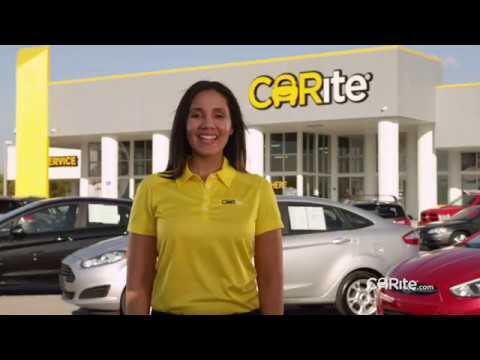 I absolutely recommend Carite for your next vehicle purchase. I just recently had a vehicle retire on me and as part of my occupation; I drive roughly 500-750 miles per week. So finding the right vehicle was a major decision and task. I researched hundreds of vehicles and car lots from south to north. I visited over 30 car lots in person. The team here at Carite was truly a game changer compared to the other lots I went to. There is no hassle when it comes to walking the lot to see what they have and they don't hassle you to come in to search online to see if one of the many sister lots have what your searching for like other car dealerships try to do. They are very competitive in their pricing so you know you're getting the best possible deal you can for the vehicle you are choosing. Wilson Lopez is one caring helpful person he got me in a nice reliable car low miles up to date car. He’s very quick at what he does never been to a car lot that I was in and out in one day I truly will refer everyone to see him about they next car. Highly recommended! Carite has GREAT cars, Great customer service from the boss man Ryan and great customer care all around. Wilson Lopez is a very good salesman. All of the people that work there are really nice. Chuck Oliver is THE MAN!!! did everything in his power to help me and my family out. my credit was horrible! and he Still worked his magic got me a down payment i could afford and a great weekly payment. i will always come back to Chuck at Carite!! and so should you!! Wilson is awesome! He followed up with me to make sure I got the best deal. He got me in a beautiful car! I appreciate him and his help. I highly recommend Carite and Wilson! Go see him! Wilson Lopez Helped me out when i needed it the most, got me in something even better then expected! For anybody who is looking for something afforadable & a great group of people to work with. CARITE is the place! Thanks Wilson & the guys!